Fig.1. Global map as published by Lyell in his "Principles of Geology" (8th edition 1850) to illustrate the past climatic changes. The climate of a region, as experienced by daily observations of a cool morning and hot midday, was for very long time considered simply the result of the height of the sun above the horizon. This idea forced a very simple view of the distribution of climates on Earth, to the poles temperature dropped, to the equator it raised, forming so large parallel climatic belts. Such a static view of the Earth also didn’t need or even allow climate changes in the past or in the future time. With the establishment of the deep geological time by the first geologists and naturalists it became clear that not only the distribution of sea and land changed over time, but so did climate. 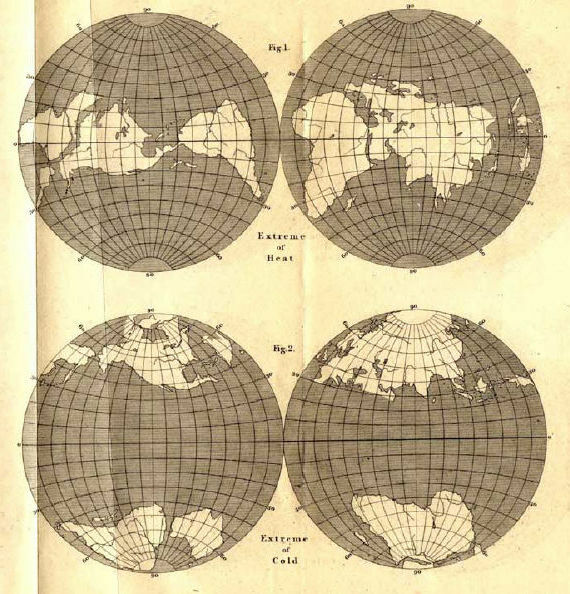 Read on how Lyell explained climate change by shifting "pseudo"-continents over the globe in the post at the American Scientific Guest Blog.